The aim of the project was to create a useable and sustainable space, including some specific objectives such as new cycle lane and cycle storage facilities, new space for the community and events, to install a Sustainable Drainage Systems (SuDS) and more. 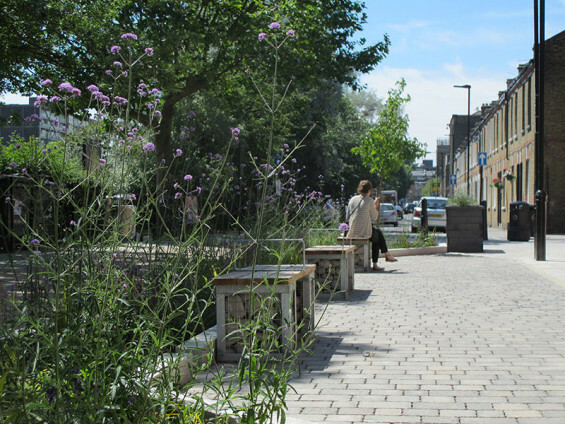 The pocket park disconnects the east end of Derbyshire Street from the combined sewer system with all surface water dealt with on site and uses various SuDS components. Another goal of the project was to provide a multifunctional space with seating areas, cycle lane and space for community and events. Moreover, it should be accessible 24 hours a day. The project also aimed to achieve biodiversity improvements through planting and making subtle adjustments in standard highway design. In addition recycling and reusing were also a target of the project. Some of the benefits of the project were the use of energy efficient LED lighting, the reuse of materials on site, enhanced biodiversity through nectar rich and native planting, and more. The local authority now sees the project as a benchmark for streetscape design. The rain garden, permeable paving, attenuating planters, green roof bike racks, bin stores and even the signage are all components that can be implemented elsewhere either individually or as a package. Furthermore, the new layout and palette of materials creates a unique sense of place that was lacking before.